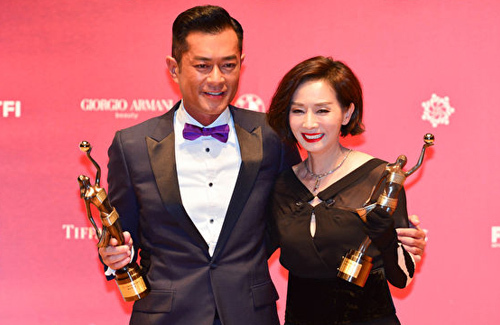 The 37th Hong Kong Film Awards concluded last night, awarding Louis Koo (古天樂) as Best Actor and Teresa Mo (毛舜筠) as Best Actress. Ann Hui‘s (許鞍華) Our Time Will Come <明月幾時有> won five awards, including Best Film and Best Director. Picking up her first Hong Kong Film Award Best Actress, 57-year-old Teresa Mo was moved to tears. In Tomorrow is Another Day <黃金花>, Teresa portrayed a mother to an autistic child. Acting for 42 years, Teresa had won Best Supporting Actress in 2006 but the top acting award eluded her until last night. “It’s like a dream for me. Thank you God!” Teresa thanked her deceased father, husband, and two daughters for their support, as well as good friends Ada Choi (蔡少芬), Kiki Sheung (商天娥), Carol Cheng (鄭裕玲), and Margie Tsang (曾華倩) for always being there for her. Congrats to all the winners! Happy for Louis of course (though his win was pretty much a shoo-in) and super happy for Teresa, whose win is long overdue. Also ecstatic for Philip Keung, whose Best Supporting Actor win was the most heartwarming, in my opinion. I was kind of hoping that Tomorrow is Another Day would win in the Best Script (that movie has some of the best dialogue!) and Best New Director categories but I’m fine with the ones who did win. Ling Man Lung did win Best New Artist award though, which I was happy about because his performance in Tomorrow is Another Day was truly amazing (obviously that’s a movie I highly recommend but definitely have a box of Kleenex ready). One of my favorite moments from the ceremony was the Lifetime Achievement Award segment (Chor Yuen gave a great speech and his little grand-daughter was super cute!). In terms of acceptance speeches, I think Louis’ was one of the best, though Teresa’s was good as well. In terms of presentation speeches, Ronald Cheng and Tony Wu’s Best Supporting Actor speech was the funniest and of course, Anthony Wong’s speech was the most controversial as usual. Good to see that this year’s awards were pretty spread out in that most of the big movies got something and one movie didn’t sweep most of the awards. @llwy12 I am pleased with the results and very happy for Louis Koo and Teresa Mo. Teresa was long overdue, just like someone else that I perrsonally think is. No matter what happens in the future, this phenomenal artist will always display a rare and incredible talent in his artistry, whether it be singing or acting. Of course Anthony could only be Anthony, controvesy and all. @jimmyszeto not that Jackie haha, but this Jacky. Whether he gets it or not, his immense talent is still centered on the highest quality like @IIwy12 said, to which I agree. Here’s a nicely written brief article from SCMP about Chor Yuen and the Lifetime Achievement Award. He gave one of the most profound, stirring speeches of the night. I’m happy that HKFA finally gave much belated recognition to this legendary director! P.S. : Louis Koo actually referenced Chor Yuen’s speech during his own acceptance speech later in the night — proves he was paying attention during the LONG ceremony…and yes, his own speech was just as good! My respect for Louis definitely went up a few notches after this.